If you go to research LASIK eye surgery online, you may get conflicting messages. Some articles rave about it, but in some cases, others link it to severe pain or even suicide. 7 Action News' Carolyn Clifford sat down with one of the area's biggest providers of eye surgery to try and separate fact from fiction, so if you go under the laser, you know the risk. If you go to research LASIK eye surgery online, you may get conflicting messages. Some articles rave about it, but in some cases, others link it to severe pain or even suicide. 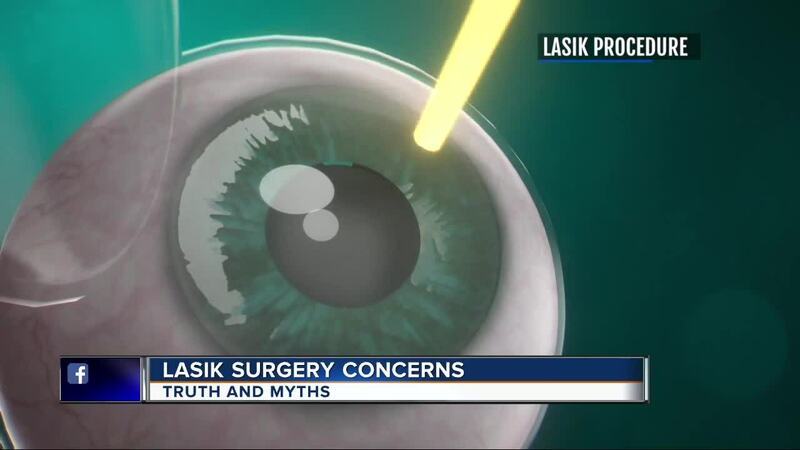 7 Action News' Carolyn Clifford sat down with one of the area's biggest providers of eye surgery to try and separate fact from fiction, so if you go under the laser, you know the risk. Make no mistake, when Jessica Starr, a meteorologist for Fox 2 committed suicide after undergoing eye surgery, it sent out a shockwave of fear. Dr. Howard Adelson of the Adelson Eye and Laser Center says Starr underwent a surgery called SMILE, not . "SMILE is a new procedure. It's been approved approximately two years, and there's still a lot about Smile we don't currently understand," Adelson said. During LASIK, your surgeon creates a thin flap. Once lifted up, a laser smooths out the underlying tissue improving vision often to 2020. SMILE creates a small arc-shaped incision on the surface of the cornea, a tiny linticule is removed an the shape of the cornea is alerted, correcting nearsightedness. According to the Romanian Journal of Opthamology, more than 250,000 SMILE procedures have been performed all over the world since 2011. Compare that to the more than 19 million times LASIK has been performed in the U.S. over two decades, with a 96 percent satisfaction rate. Hedi Rich, who had trouble seeing colors for her job, had LASIK eye surgery done by Adelson in December. She said she was not fearful about cases of suicide or pain. Adelson said about 93 percent of his patients have had 2020 vision or better after the procedure in his office. He said albeit rare, there are cases that give you pause. One woman lost her only son to suicide after LASIK. He was in the military. She said he complained of severe pain, like needles in his eyes, then light sensitivity to a single lamp. Adelson said long-term pain is extremely atypical for patients, but a little bit of burning for three hours while the eye is healing is normal. The man who took his own life wrote a suicide note saying he could not live without his eyesight. Holly Coffer started an online support group, and so far, 6,400 people have joined, with more stories linking eye surgery to suicide and pain. Adelson and the LASIK eye surgery injury as a whole do not believe it will cause someone to commit suicide. While bad outcomes sometimes occur, experts say the risk is extremely low. LASIK eye surgery is an elective procedure that will cost you $1,000 to $3,000 per eye. The Journal of Cataract and Refractive Surgery reports that 96 percent of patients are satisfied with the outcome of their surgery.